The Young Voice’s Professional Music Workshop recruits professional musicians to teach and mentor at-risk middle and high school youth in the San Gabriel Valley. 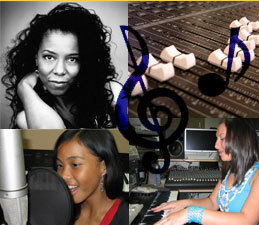 The workshops are directed by multi Grammy nominated artist Patrice Rushen. It features students working and performing with artists such as, Teena Marie (Grammy nominated artist who will also perform on our album), Ndugu Chancler (Producer), Oren Waters (one of the most recorded backing artists ever) and Gerald Albright. For audition information click here. The culmination of the workshop will result in a CD featuring musical collaborations between the students and the professionals. The theme of the CD will be Peace, Unity and Personal Responsibility. The CD will be sold nationwide as a tool to raise money for various non-profit organizations. This year, the beneficiaries will be Pasadena LEARNS, Pasadena Unified School district’s after school enrichment program for low income families and “Mustangs on the Move”, an after school program for disadvantaged high school students. Many of our students, who are not achieving in school, show a great interest in learning music. We use music celebrities and production to teach our students valuable life skills such as teamwork, goal setting and critical thinking throughout the recording process. Each of our participants must maintain a 2.0 grade point average and a good school attendance record. Our primary goal is to use this program as a motivator that will generalize to other areas of learning. This program gives students an opportunity to learn about quality music from established professional musicians and exposes them to many internship opportunities. Each week Ms. Rushen invites various musicians and engineers to lecture, perform and mentor our students. All of the artists teaching in the workshop and performing on the CD are donating their time. We are requesting money needed to pay for studio time and engineers to complete this project. This will cost $30,000.